Schuble Estate Online Auction — Harritt Group, Inc.
10% non-refundable down payment due within 24 hours following the auction, balance due within 40 days. Taxes prorated to day of closing. Possession immediate at closing. Selling as is with no contingencies, all inspections welcomed prior to auction. Property sells subject to seller’s confirmation with a below market reserve. Fixer Upper in Great Location! 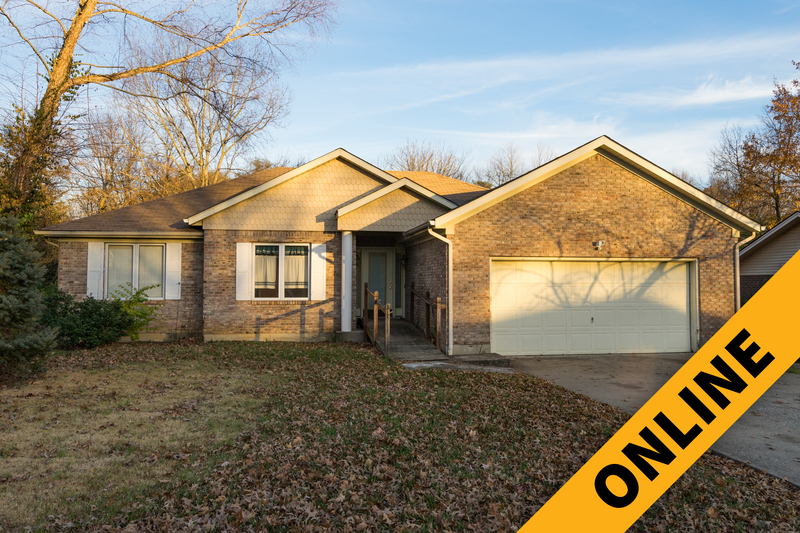 Brick 3 Bed – 3 Bath ranch with walkout basement and attached 2-car garage in established neighborhood off Old Vincennes Road just minutes to downtown New Albany with easy access to the State Street medical corridor. Great potential! Brick 1607 square foot ranch built in 1991 with walkout basement, attached 2-car garage and utility shed on 82’ x 115’ lot in Carriage Estates, a small established neighborhood located just East of Capt. Frank Road. A well-designed split bedroom plan features large eat-in kitchen, family room with arched entry & beamed ceiling, master bedroom suite with full bath and walk-in closet, 2 additional bedrooms, full bath and spacious laundry room on first floor. The walkout lower level has 1583 square feet and includes 3 large rooms, full bath and storage room. Home has electric heat, central air, rear deck and needs renovation. Great potential for a fix and flip, rental or homeowner! I-265 to State Street Exit 1. South 1/2 mile to right on Capt. Frank Road. West 3/4 mile and continue right on Capt. Frank Road. Travel 3/4 mile to left on Old Vincennes Road. 3/10 mile to right on on Carriage Lane to home on left.